Refugees' Rest is a dilapidated tower east of Windhelm and close to the Morrowind border. It is inhabited by leveled animals. It is easily found by taking the road northeast from Windhelm, passing Brandy-Mug Farm, Hlaalu Farm and Hollyfrost Farm and then continuing towards the border with Morrowind. It is the last building before the border is reached and was once an important meeting place for refugees from Morrowind following the Red Year. However years of abandonment and neglect have taken their toll on the tower, as its foundation is beginning to collapse and it has tipped and sunken into the ground. 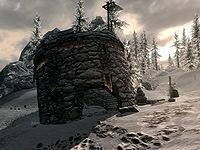 The doorway into the tower is on the southwestern side leading into the ground floor which has bones and rubble strewn all over the floor along with copies of Ancestors and the Dunmer and The Firsthold Revolt. A typical stone spiral staircase leads up to the top of the tower where there is an adept locked chest but nothing else of interest. Outside to the northeastern side of the tower is a small graveyard partially surrounded by a broken-down stone wall. 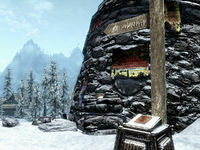 At its base along the road is a plinth holding the Decree of Monument, issued by all the Jarls of Skyrim to commemorate the tower's past. There are numerous snowberry bushes and various colors of mountain flowers typical of the region around the tower. On the opposite side of the road to the entrance are the remains of a wagon partially buried in the snow.